Monday, August 29th, 2016 was Lakeview’s annual band night and it was spectacular. Harding was up first to perform their show titled “Uprising.” The Raiders kicked off the show with Fall Out Boy’s “The Phoenix” off of their 2013 album Save Rock and Roll. Following that was “Victorious” by Panic! at the Disco, which was a majorette feature. Unlike any other band that night, Harding had a tremendously prominent brass section which made the audience feel like they had a front row seat at a concert. Following the majorette feature was “Dark Horse” by Katy Perry. Even though they performed each song well, by far the best part of Harding’s performance was when the percussion section broke out into an original selection arranged by their director. The snare drums started to play not only on their own drum head, but their neighbor’s as well! 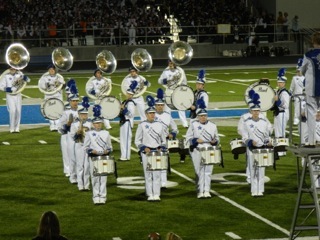 It was something straight out of the movie Drumline. The last three songs included Uprising by Muse, “Confident” by Demi Lovato, and “They Don’t Care About Us” by Michael Jackson. 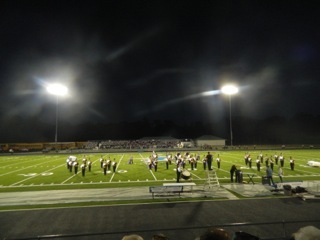 Howland started their show with “Lady Madonna” by The Beatles, followed by Elle King’s “Ex’s and Oh’s” during which the band performed their band dance. The Tigers’ drum major was by far the most energetic, especially when he had a baton in hand. It was hard to take your eyes off of him while he did complicated tricks in front of the band. 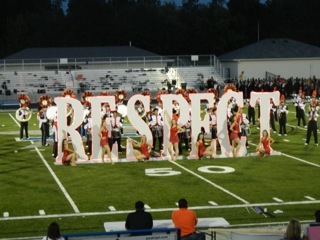 Their majorettes were featured in “Respect” by Aretha Franklin and one of the most exciting parts of that song was the big lit up letters that the majorettes started in front of. Following that selection was Queen’s “Crazy Little Thing Called Love.” This drill was my favorite to watch of their’s because, being a former member of the marching band, I could tell how hard the Tigers had to work to split up into little pods like they did while still being synchronized with their other movements. Keeping with the theme of the King of Pop, Howland turned back the clock and performed a rendition of “I Want You Back” by The Jackson 5. Rounding off this exciting show, the band slowed things down with Prince’s “Purple Rain.” They had a wonderful baritone soloist and a slow calming start to the drill. Both the song and the drill picked up soon after, but after all the energy from the other songs, it was nice to have a little time to relax. 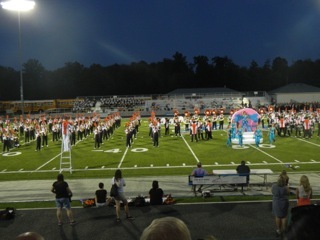 Succeeding Howland was the Crestview High School Marching Band. Compared to Howland’s band of 200 plus, it was quite a shock to see so much of the field under Crestview, but bigger doesn’t necessarily mean better. 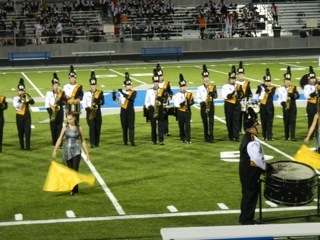 The theme of this band’s performance was “sleep” and that can very apparent when they wheeled a few prop beds that were continuously being climbed by majorettes and band members. Not only was Crestview such a small band and their show was very slow paced, but they also had no interruptions from an announcer. Instead, before the band began, the announcer told us the theme of the night and all of the songs and then let the band do its thing. The songs performed ranged from pop like “Some Nights” by FUN to musical theatre like Phantom of the Opera. It was such a different show from the others that it really caught the audience’s attention. Finally, ending the night were our own Lakeview Bulldogs. 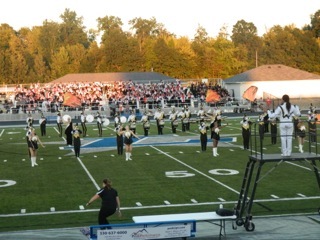 As you will know if you have attended any football games this year, our show centered around “time.” Fall Out Boy’s “Centuries” started it all off featuring trombone soloist Leigha Carlson. Next the majorettes had a rockin’ feature in “Times Like These” by the Foo Fighters. 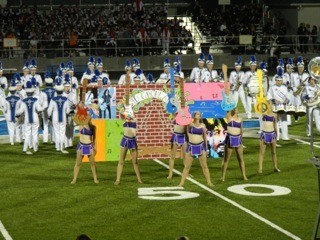 Our props were on point with the wall behind the majorettes featuring art from Dave Grohl Alley in Warren and removable glam guitars that our majorettes rocked out with toward the end. Since the theme was time, it was only fitting that our Marching Bulldogs played “Clocks” by Coldplay. The song started off with a cheesy, but great little skit between our announcer and tuba player Tucker Gidden during which Tucker had to fix the lifesize metronome various times and at one point he even made our band literally rewind. It was an amazing section of the drill that looked so effortless and real. I even think it was better than when the band took the shape of a clock with moving hands. The band unleashed their band dance during “Old Time Rock n Roll,” which also featured a sassy dance from the majorettes. To finish off the show the band played “Monkey Time” by Major Lance and “Viva la Vida” by Coldplay. During “Viva la Vida” the band toned down the verses of the song and brought it in the brass section during the chorus. The song also had a beautiful crescendo that really brought everything together and ended the show on a high note.